Every last detail of our facility has been designed with the comfort of your companion and yourself in mind. 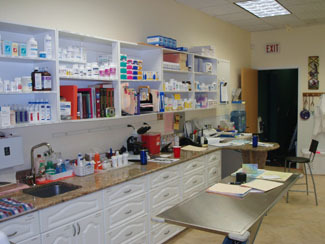 Since most people and pets feel stress when they have to visit the veterinarian, the waiting room and waiting lounge were designed to look like welcoming sunrooms. Our exam rooms were designed to feel welcoming and home-like as well. For the hospital, we selected warm fiberglass cages instead of stainless steel, and we have separated cat and dog wards. Hospital tours are welcomed. Because our companions cannot speak and may not show symptoms until illness has progressed, we routinely perform laboratory diagnostics to better evaluate their health status. This is an integral part of our preventive program, our medical work-ups, and our pre-anesthetic testing. 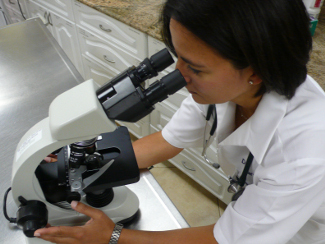 Our in-house clinical laboratory can provide immediate results in the face of an emergency. When specialized or routine testing is required, we work with expert veterinary laboratories to obtain quick results.